The only trouble with living close to an iconic landmark or attraction is that you rarely get up close and personal with it. How many attractions are in your area that you seldom, or have never visited? You know they are there but you keep saying “One day I’ll climb that mountain”, or “One day I’ll visit that castle”, but that ‘one-day’ slips further away until you start saying, “I’ll get there, some day”. 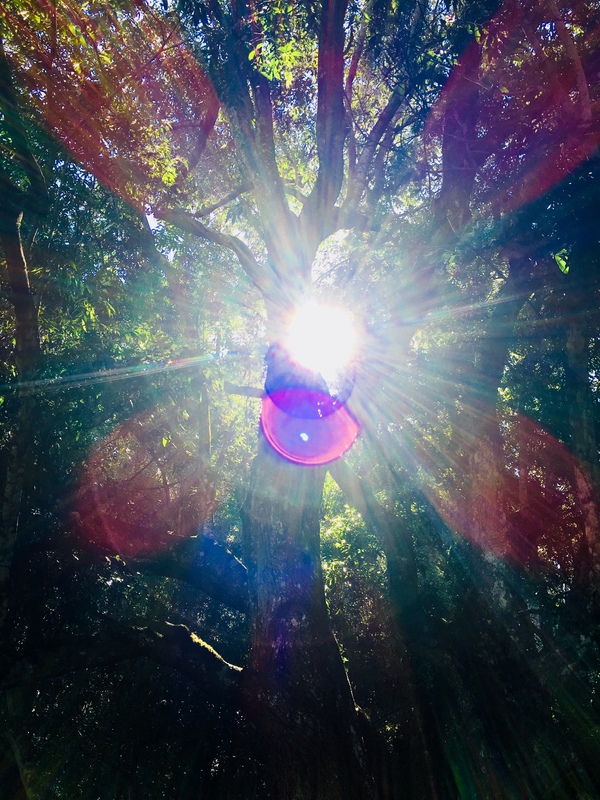 And that’s how it was for me, living in the shadow of Mount Warning, in the beautiful Northern Rivers area of New South Wales – my one-day just kept slipping by. Then ‘one-day’ a friend mentioned a cafe she had been to, that I hadn’t. We consulted our diaries, decided on a day and time, and headed out of town. 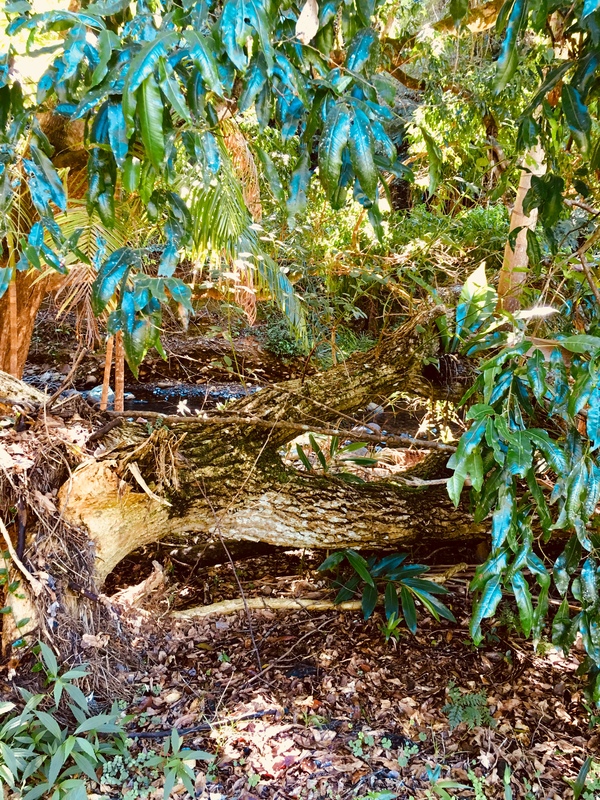 We were in search of the Rainforest Cafe, nestled in the leafy surrounds of the base of Mount Warning, otherwise known as Wollumbin, which is the Aboriginal name for Mt Warning. So we sat by the creek at the Rainforest Cafe, under the trees, and sipped our milkshake, and coffee, and ate amazing Middle Eastern cake. 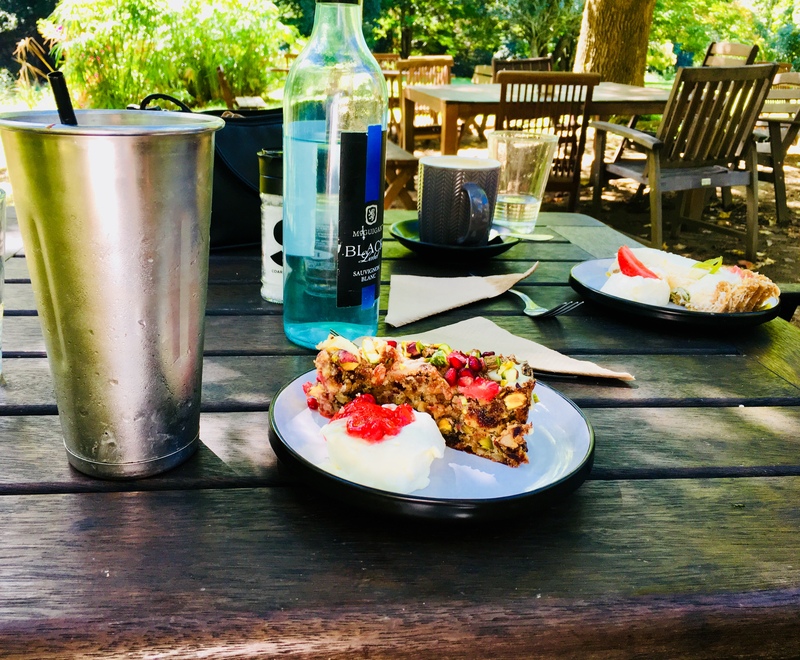 In the process, we managed to prove that there is no better place for a relaxing breakfast, lunch, morning or afternoon tea than the Rainforest Cafe at Wollumbin. And then, to offload the calories, we walked through the trees beside the creek, taking photos of nature at its best. Okay – this isn’t the best photo I’ve ever taken, but I love the effects.. There is no shortage of colour, shapes and rays of sun to capture in photographic spleandour. You just need a full battery on your smart phone and you’ll have plenty of content to upload on whichever Social Media you subscribe to. 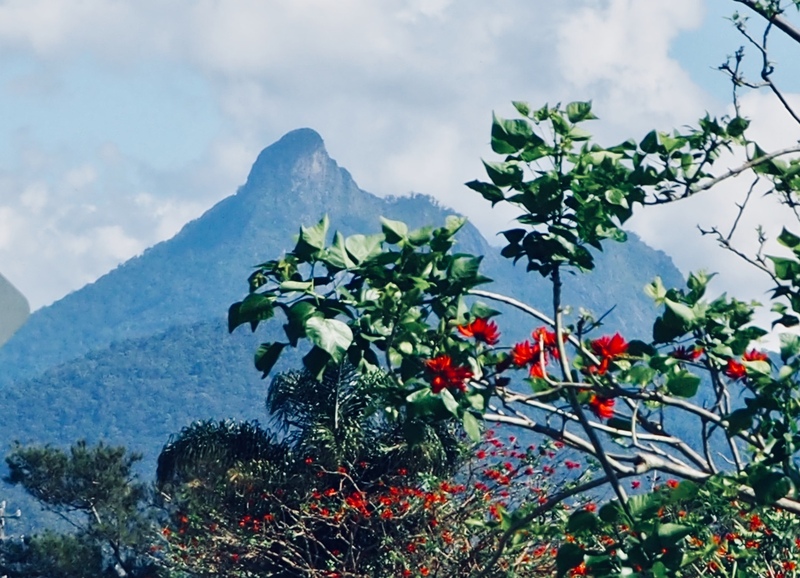 When we left the cafe, a right-turn took us up the hill towards the majestic Mount Warning. The road was steep and narrow; there isn’t a lot of room for passing another car on that road. But luckily there wasn’t much traffic and my friend’s car made the climb seemingly effortlessly. Although, when we reached a plateau’d car-park near the top, there was a slight ‘hot’ smell coming from the engine. Compact car – steep climb, what more could we expect? 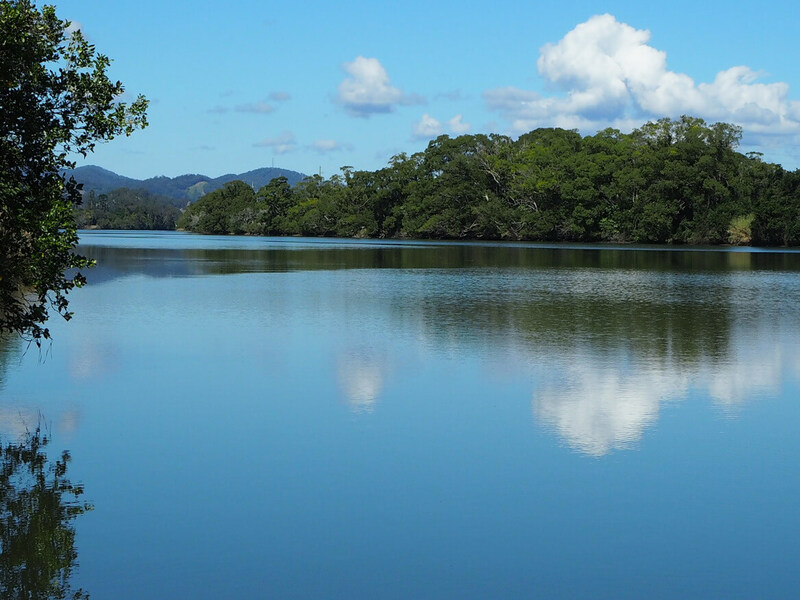 The Bundjalung People are the original custodians of the land surrounding, and beyond Mount Warning. For them, the mountain is a sacred site. With respect for the Bundjalung people, I would rather treat the site as sacred ground and not climb to the top of Mount Warning. Just to be able to see its beauty up close and personal from a lower point, is all I need. Mount Warning is said to be the first place in Australia to witness the birth of every new day, as the sun peeps over the mountain, ready to warm the earth below. 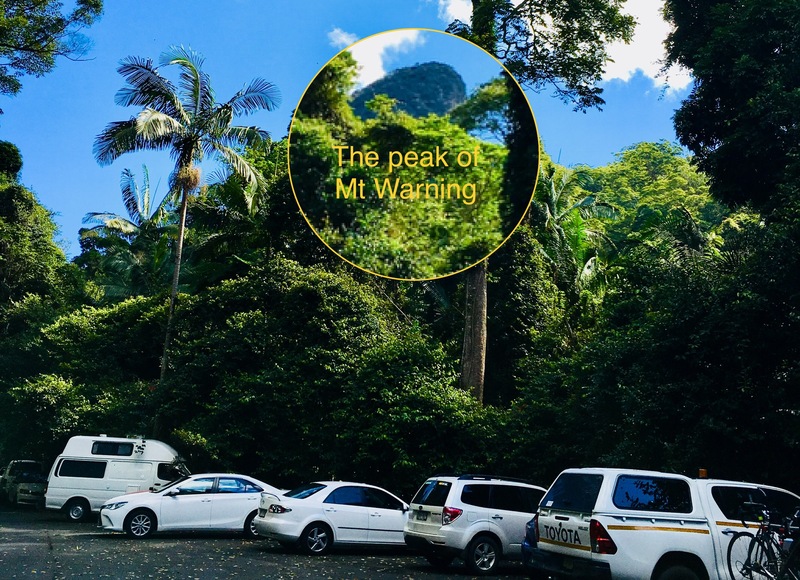 While it boasts a New South Wales address, Mount Warning is still close enough to be a short trek for South East Queenslanders, and visitors to the Gold Coast. The uniqueness of its peak makes Mount Warning easily identifiable, from both sides of the border. Seeing Mount Warning from a plane, while taxiing into the Gold Coast Airport, is the warm welcome-home you look forward to, after travelling far and wide. The only thing that says “Welcome Home” louder than Mount Warning, is the Tweed River, as you drive along Tweed Valley Way on your way into Murwillumbah. Only then do we appreciate the real beauty of where we live. What! You don’t believe me? Then come and see for yourself. Oh, and let me know when you’ll be heading into town and we’ll meet for a coffee, I know all the best places, and they are all in the shadow of Mount Warning. When the water is so crystal clear that you can look across the river and see the sky, the clouds, and the trees mirrored on the surface, you are seeing nature at its best. That’s what makes the Tweed River so spectacularly beautiful. As you drive along the Tweed Valley Way, with one eye on the road and the other on the sun glistening on the water, you will be mesmerised by its beauty. The colours of the water mirror nature’s palette of colours. It’s as if Mother Nature has spent the dark hours of the night mixing the vibrant blues and greens, for those lucky enough to see her masterpiece in the morning light. Artists and photographers try to capture the beauty, but few can do justice to what nature provides for us, free of charge. Just look in the mirror and see the beauty of nature.